Troubleshoot the causes and find the solutions to wet basement walls – the sooner, the better, to maintain the integrity of your home. Because they’re built below grade, basements tend to take on water. 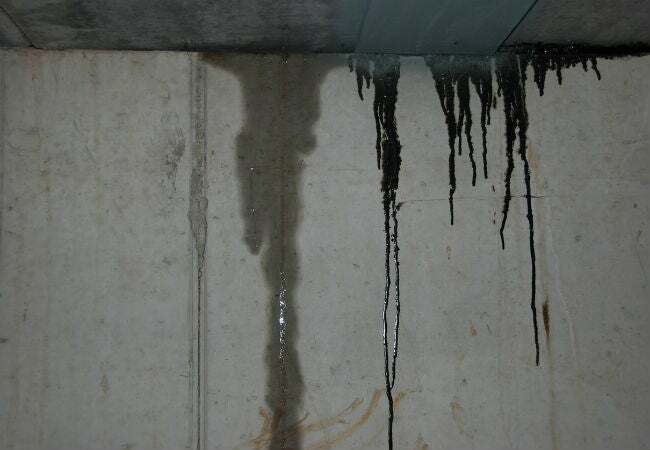 You may notice moist basement walls from time to time, water puddles here and there, or—worst case scenario—flooding during the rainy season. Humid, damp, or downright wet basements can result in peeling paint, mold and mildew growth, rotted wood, and damage to stored items. While builders take steps to waterproof basements during construction, over time a house can settle, creating cracks in the basement walls. When the soil outside becomes saturated, water can seep through these cracks. Even structurally sound basement walls can absorb water from the soil and transfer it to the basement interior, making the walls feel wet. As the water from the walls evaporates, the air in the basement becomes more humid. A high-quality dehumidifier will help remove excess basement humidity, but the best long-term solution is to waterproof the walls. Depending on the reason for the moisture problem, the fix could be a simple do-it-yourself remedy, or it could require the assistance of a foundation contractor. If you’re looking at waterproofing basement walls, the following tips will get you started on the right foot. DO determine the source of the water. Because concrete is porous, you can often see wet streaks that let you know where the water is coming in. Look for streaks along cracks, at the corners of windows, between mortar joints (for cement block walls), and around pipes where they enter or exit, such as a water-supply line or a sewer pipe. If entire wall surfaces are wet, however, you’ll need to do further sleuthing. To conduct a simple condensation test, dry an area of the wall with a rag and then attach a one-foot square piece of aluminum foil to the wall with duct tape. Peel off the foil after 24 hours and check how the underside of the foil feels. If it is wet, water is seeping through the wall from the outside. If dry, the moisture is originating elsewhere in the basement, most likely from a basement shower—easily remedied by installing a vent fan in the bathroom to direct steam outdoors. DON’T make wall repairs with standing water in the basement. During a rainy season, a crack in a basement wall can allow an inch or two of water in, but before you seek to repair the crack, remove all the water from the floor. Working in a flooding basement increases the risk of electrical shock or electrocution. Turn off the power to the basement, and then use a utility pump (with extension cords that reaches an upstairs outlet) to get rid of the water. The pump will discharge the water to the surface of your yard via a garden hose. When the basement is water-free, proceed with inspecting, fixing, and effectively waterproofing the basement walls. DO fill cracks with hydraulic cement. Another area where cracks are commonly found is at the bottom of the basement walls. When a foundation is poured, its footing—a wide flat base made from concrete and reinforced steel, designed to support the walls—is poured first, and then the walls are poured on top after footings harden. Although this is standard construction procedure, it can create what’s known as a “cold joint,” a weak spot in the foundation between the wall and the footing where cracks can develop with the shifting and settling of a foundation, along with lateral pressure from the soil. Fortunately, sealing cracks is a relatively simple DIY task that involves filling them with hydraulic cement, such as QUIKRETE’s Hydraulic Water-Stop Cement (available from Home Depot). Hydraulic cement—which contains additives that cause the cement to expand and set rapidly—is mixed with water to a heavy putty consistency and then pressed into cracks with gloved fingers or with a putty knife (follow mixing and application directions). As hydraulic cement expands, it pushes deep into cracks and crevices to form a watertight bond. Mix only as much as you can use within three minutes, though, because that’s how quickly it begins to set. DON’T forget to address window well leaks. Window wells are a common source of basement wall leaks because they tend to retain water if a proper drainage system wasn’t installed beneath the well when the house was built. This can lead to water pooling around the bottom of a basement window and then seeping in. While it’s difficult to install a window well drainage system after the fact, consider digging approximately two feet lower in the well area, and then filling the space with gravel to help rainwater disperse rather than collect in the window well. Then, caulk around the window with a caulk suitable for use on masonry, such as GE’s 100 Percent Silicone Window and Door Caulk (available from Home Depot). In addition, install a sloped window well cover, such as Shape Product’s Universal Fit Polycarbonate Window Well Cover (available from Home Depot), over the window well to direct rainwater away. DO apply a masonry waterproofing product to bare interior basement walls. If your foil test showed that water is soaking through your basement walls and leaving them wet, seal the interior of the walls with a high-quality waterproof paint, such as DRYLOK White Extreme Waterproofer (available from Home Depot). This type of sealant comes premixed and goes on just like a coat of paint. When waterproofing basement walls with it, brush or roll the paint on thickly enough to fill all the little surface holes, then allow it to dry fully before a second coat is applied. When completely dry, the sealant forms a watertight bond to keep any more moisture from seeping through. A five-gallon container treats approximately 500 square feet of wall. DON’T apply sealer over painted walls or efflorescence. If you or a previous owner painted the basement walls, you’ll have to remove the paint before applying sealer, which only adheres well to bare masonry. It’s common to find several coats of paint in older homes, which is best removed with a sandblaster by pros known as blasting contractors. Alternately, it can be removed by wire brushing, a tedious but inexpensive DIY task. 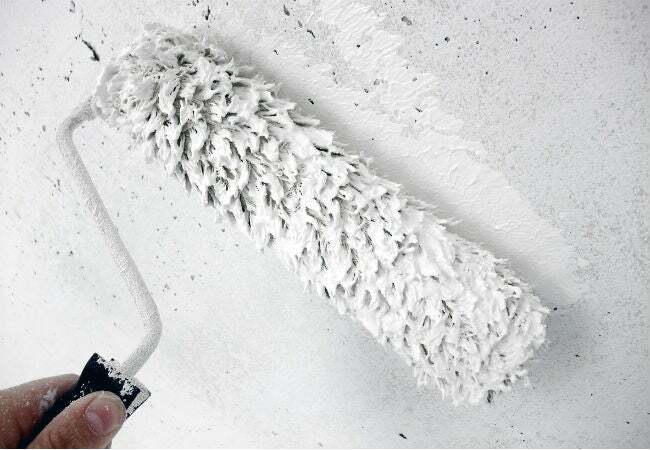 It’s also necessary to remove efflorescence—white deposits that form on the surface of concrete walls subject to constant moisture—before applying sealer; do so with muriatic acid (follow the manufacturer’s instructions). DO take steps to keep water away from your basement. Sometimes, the solution to wet basement walls is easy. For instance, remove foundation plantings, such as bushes and flowerbeds that require watering, which subsequently allows water to seep into the basement. Also inspect and, if needed, repair guttering and downspouts to ensure that they’re directing water away from your home. It’s also a good idea to grade your yard away from the foundation—at least a two percent slope. In addition to the above steps, consider having an exterior drain tile system installed. This is usually a last-ditch effort because it’s pricey, easily running $10,000 or more. It requires excavating the soil from around the outside of your basement in order to install a perforated drain at the footing level. A waterproof membrane is often installed on the outside of the basement wall, and the system also requires putting in a buried sump pump where water will collect and then be pumped to the surface. This is strictly a job for a foundation contractor, but it could greatly reduce basement water problems. DON’T forget interior drainage solutions. Another method of attaining dry basement walls is to install a drainage channel beneath the floor inside the basement. The drain is similar to the exterior drain tile described above, but it’s located just inside the basement walls; then, new walls are built on the inside of drain so the original basement walls are not visible. This is another job for a foundation contractor, at a minimum cost of around $5,000. When it’s done, you’ll have new, dry walls, and any residual water that seeps through the old basement walls will be directed to the drain channel and pumped away.